New Series of High Bay LED Fixtures that deliver 140-150 Lumens per Watt with up to a 12 Year Warranty. There is no reason why today's consumer shouldn't expect an LED lighting fixture to perform at its highest rated specifications for well over a decade. "It all comes down to the science," says Klaus Bollmann, CEO for ActiveLED. "There is no reason why today's consumer shouldn't expect an LED lighting fixture to perform at its highest rated specifications for well over a decade. 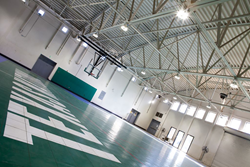 At ActiveLED, we've developed the technology, and the proof is in this newly released series of high bay fixtures." Applications include: Gymnasiums, Pools, Warehouses, Manufacturing Facilities, Grocery Stores and Storage Areas. For more information and specification sheets detailing the High Bay LED Lighting Series by ActiveLED, CLICK HERE or contact ActiveLED directly at 888-288-9080. ActiveLED, Inc. is a subsidiary of Ringdale Industries and designs, manufactures and assembles high performance LED lighting luminaires in America. ActiveLED is based in the United States with offices in the United Kingdom, France, Japan, and Singapore.